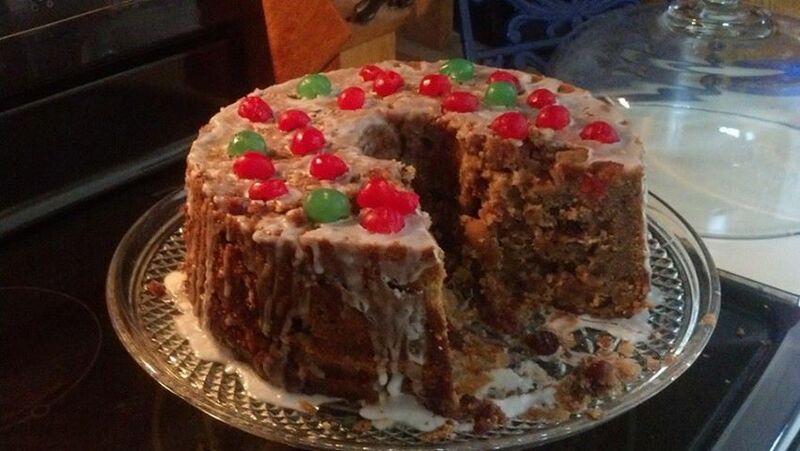 Growing up I was under the impression that the gift of a fruitcake was usually done so as a joke. Perhaps this is true for the store bought version. However, the homemade variety would be a sign of true friendship. This is especially true after it is realized how expensive and how much labor is involved in creating the authentic delicacy. At least 24 hours before the cake is to be made the dried fruits should begin soaking in the rum sauce. Chop your fruit choices into small pieces, no larger than the size of a dime. Place into a container large enough for the fruits to double in size. Add rum, wine, spices and stir thoroughly. Stir frequently until ready to add to the cake batter. Used in steps 13 & 20. Create and serve mulled hot apple cider at least 24 hours before the cake is to be made. Pour apple cider into a crockpot or cooking pot. Add sliced apple, sliced orange, cinnamon sticks, and filled spice-herb ball. Cook half a day or until flavors are infused. Save back 2 cups of fruit pulp or whatever isn’t consumed during the enjoyment of the hot apple cider until step 8. When ready make the cake begin first with the caramel sauce. In a pot melt butter. Add brown sugar, milk, and vanilla. Bring to a boil and whisk gently until sauce thickens to the consistency of eggnog. Set aside until ready to add to the cake batter until step 11. Sieve flour and baking powder together. Set aside until step 12. Separate egg yolks from the whites. Whisk egg yolks and vanilla together. Set aside until step 9. Whisk egg whites until they peak like a meringue. Set aside until step 15. Melt butter and mix with fruit from the mulled hot apple cider and powder sugar together until smooth. Stir in egg yolk mixture. Stir in homemade caramel. Reheat to a liquid if it has hardened. Strain the soaked fruits and nuts. Set aside the rum sauce. Gently stir in soaked fruits and nuts. Gently stir in whipped egg whites. Grease the angel food cake pan and pour in batter. Turn down temperature to 225 for 45 minutes or until batter no longer sticks to a toothpick when checked. Turn up temperature to 300 degrees for 30 minutes or until rum sauce has cooked down to a glaze. Pour rum sauce over the top of the cake. Using an ice pick poke holes into the case so the rum sauce and soak through. Flip cake upside down onto a cake plate and remove angel food cake pan. Use a knife to remove any sticking from the sides before the cake is flipped over. Slice red and green maraschino cherries in half and decorate the top of the cake. 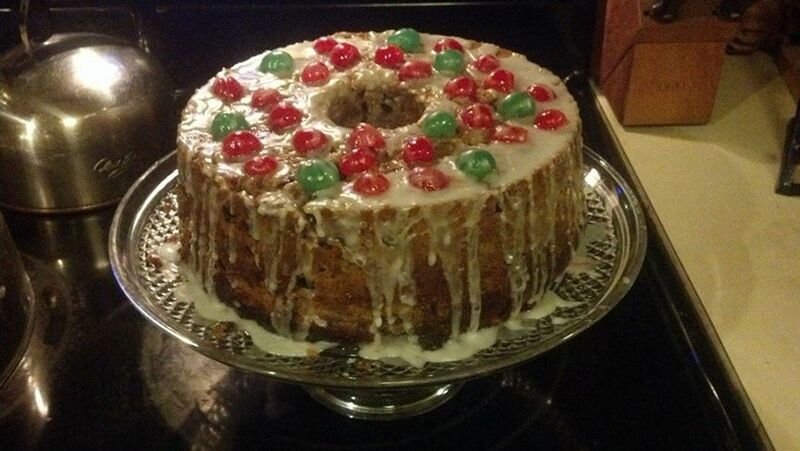 Drizzle powder sugar frosting over the top and sides when fruitcake is cooled. Powder sugar frosting is made with 2 cups of powdered sugar and mixed with just enough water to give the frosting the consistency of white craft glue. This recipe was obtained from mixing and modifying several recipes. Fort Mifflin’s mulled hot apple cider recipe obtained during a 2001 Halloween ghost tour.